In a weekend of notorious unpredictability we got the biggest surprise of all in the British Grand Prix race: it didn't rain. Yes, after what seemed never-ending precipitation on Friday and Saturday things were unremittingly dry and sunny for the race's duration. Even better we were treated to a mano-a-mano race-long battle between Mark Webber and Fernando Alonso. And it was all resolved in Aussie Grit's favour with only three laps left, with a brave, decisive move around the outside of Brooklands turn. It is always a real treat to see Webber and Alonso lock horns. Here we have two proper racing drivers who crucially also have massive respect for each other on and off the track. So while the battles are taken to the very edge never are they crude. That's exactly what we saw today. 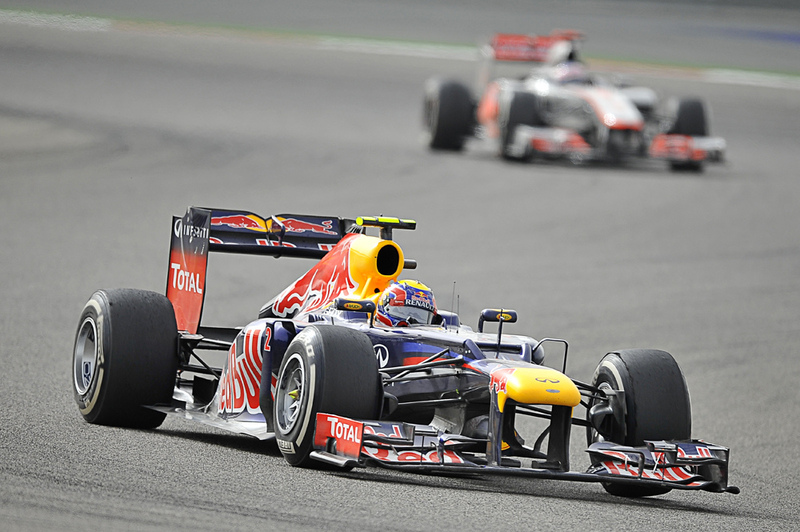 In an ever-unforeseeable 2012 year in F1 Mark Webber's form is possibly the biggest surprise of them all. Following on from a difficult 2011 most entered this year expecting him to retain the status very much as Red Bull's 'other driver', especially with both he and Sebastian Vettel a year older. More widely, this was meant to be a year's grace in the big time for Webber before he was moved on to make way for a younger pilot. But all of this reckoned without the man himself. Not for the first time he's proved us all wrong, and via a season of determined, consistent and quick driving, wherein he's rarely failed to play his given hand as well as possible, he is now but 13 points shy of Alonso at the drivers' table top and all of a sudden looks a genuine title contender. 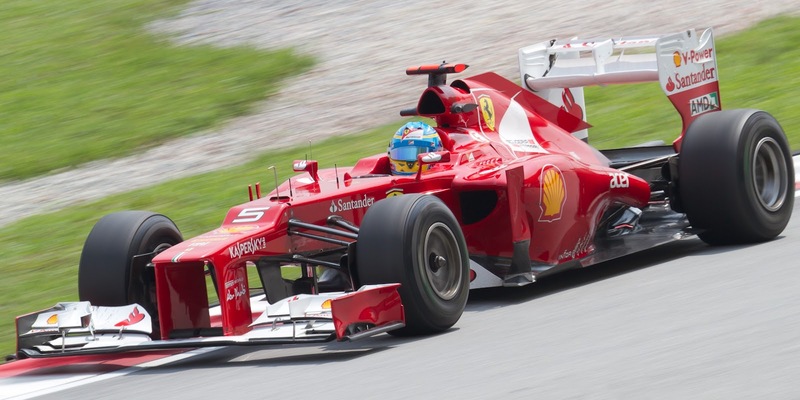 Additionally, he's got Red Bull and Ferrari having a tug of love over his services for 2013. Let's think twice before we write him off again. Most of the way the win looked like Alonso's for the taking though. 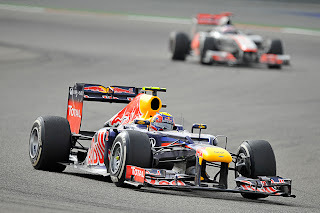 He led from pole, usually comfortably enough, right up until the final race stint and Webber's late pass. But crucially he went a different way on strategy to the Bulls behind. Given the persistently wet conditions in qualifying the drivers had a free choice on the tyre compound to start on, and as it was wet for most of practice too it was rather a step into the unknown. 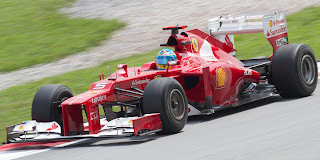 Alonso started on hards while the Bulls both started on softs, with the vast majority reckoning the hards were what you wanted most of the time (it's been suggested that Ferrari was gambling on rain during the race and thus not having to use the softs). Anyway, Alonso wasn't able to make enough of an escape early on, and in the final stint when he finally had to put the soft tyres on Webber gobbled up his advantage. 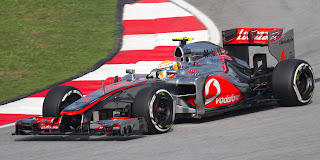 Alonso had no reply and Webber made the lead his with three tours remaining, as mentioned. Vettel in third similarly closed in on Alonso, but ran out of laps to make it by. Equally suddenly, in the ephemeral 2012 season we just might be getting some kind of clarity on the scheme of things at the front. Although 2012 never ceases to surprise us, meaning conclusions have to be tentative, on the evidence of today it looks like it could boil down to a struggle of Red Bull vs. Alonso. Red Bull didn't dominate to the same extent as in Valencia, but at a very different track configuration to there they still looked strong at Silverstone, and this all bodes well for them. And the Ferrari looks a completely different car to the one with the difficult birth earlier this year (and probably to a large extent it is). Alonso being beached in the gravel in Melbourne qualifying, at which point few thought the F2012 was good for a point let alone a win, may as well be four years ago as four months ago. The Scuderia's in-season improvement has been strong, evidenced also by Felipe Massa's recent racy showings (and I mean that with all the respect in the world, as Alonso is generally much better at driving around a fundamentally bad car than Massa is) which he continued today with a good run to fourth place but 6.5 seconds shy of his team mate at the end. The Ferrari probably isn't as good as the Red Bull, though it appears not too far off. And Alonso is always capable of making up some of the difference. Lotus appears to have the pace on race day to stay with them, even to beat them, but today was a little bit of a season in microcosm for the Enstone cars. Both drivers had a bit to do from their qualifying slots, and Romain Grosjean yet again had early race contact and needed to pit for a new nose. But from then on he looked the quickest guy out there, and did a great job to come through the field to finish sixth, only 17 seconds away from the winner. It's astonishing that the car hasn't yet won a race in 2012; low grid slots and, it has to be said, early race contact from Grosjean have been the main culprits in keeping the team off the top of the podium thus far. Surely one weekend it'll come together, but it's all rather precluding a championship run. Then there's McLaren. On race day at least the car seems to have lost something, and the drivers are saying so. Lewis Hamilton is doing his formidable best, and while the qualifying pace isn't usually all bad it appears to lose something to its competitors in retaining tyres over a race stint. And a rather distant eighth and tenth with Lewis ahead of Jenson Button was the best they could muster today. The team needs to find an answer and soon. But the real story of today is a determined and aggressive drive from Mark Webber, rewarded with a worthy win and a strong place in the drivers' table. His homing in on Alonso in the late laps was heart in mouth stuff, ensuring 2012 continued its trend of giving us something to look at right to the end of a Grand Prix. As an aside, I recall in the not too distant days of refueling and rock solid tyres F1 strategists would talk routinely of 'racing to the last stops' (i.e. the race order would effectively be set at that point). Don't let anyone tell you that what we've got now isn't better. Great post Graham. I agree that Lotus will pounce for a win this year. But with his strong finish after that messy start, I suspect it'll be Grosjean rather than the Finn on the top step. Thanks very much Michael. Glad you liked it. Without Grosjean's qualifying spin and certainly without his early contact and wing change I think he could have won on Sunday. He certainly had the pace to do so. He's also been consistently the quicker of the two Lotuses for a good few races now. It's rather strange to think that Kimi's strength his year has not been pace so much as consistency and staying out of trouble.